Sometimes fantasy is the only means we have for confronting the unthinkable. Those unthinkable things could be as grand as the end of industrial civilization (Mad Max), or something as personal as one’s own worthiness. Porco Rosso is a way of dealing with personal insecurities through fantasy, even while it’s also a rollicking, two-fisted period romp. The fact that it’s full of action and color doesn’t mean the film isn’t serious; it’s that all the really weighty subjects in the movie — the feeling of being an outsider, of being disqualified from being human — bubble away below the surface without being given short shrift. 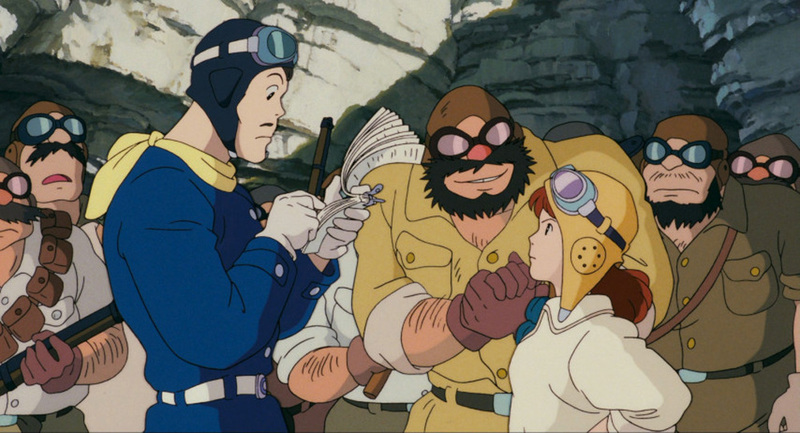 This is why I say that of all Hayao Miyazaki‘s films, it is easy to make a case for Porco Rosso being one of the most personal, in the sense of being the one most directly informed by his own feelings about himself. I know full well that sounds like the sort of vest-pocket psychoanalysis I myself resent (we don’t know the man; we know his films and a few of the things that have come out of his mouth), but so many of the things that have filtered into the film from the rest of his career seem in that vein: his love of flying and his nostalgia for a golden era of same; his feelings about adulthood (read: old-man-hood) vs. childhood, and men vs. women; and his combined admiration for and ambivalence about technology. But it never once forgets to be any of the other things it ought to be: entertaining, funny, charming, heartfelt. There was a time when Marco was just Marco, but sometime after he deserted a WW1-period Italian Air Force, he became known as “Porco Rosso”, the Red Pig — so named for the curse that descended on him and left him with the features of, well, a pig. Small wonder he hides his snout and ears behind the collar of a coat and under an aviator’s cap, and parks his single-engine seaplane in a cove on a deserted island somewhere in the Adriatic Sea. 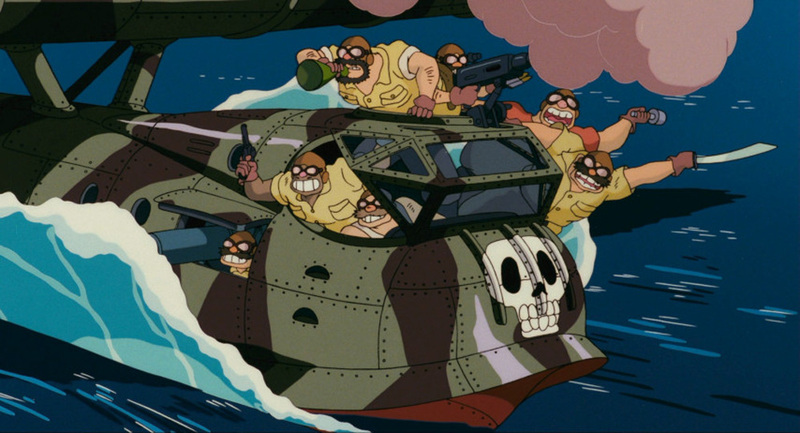 He’s a mercenary, jetting out across the ocean for a paycheck, taking out the engines of sea pirates’ planes with the surgical precision that earned him his earlier reputation. But this isn’t a living, and he knows it. It’s a mere existence, even if there are fun moments in it. When the Mama Aiuto pirate gang kidnaps a bunch of schoolgirls and holds them for ransom, Marco swoops in for the rescue — only to find the girls have been more trouble than they were worth, and are better swimmers than the pirates to boot. The whole escapade puts just enough money back in Marco’s pocket to pay off the rest of his plane, but also further embitters him to one of his many would-be rivals. This particular one, Curtis, is an American showoff in deep with the pirate gangs himself, and has eyes towards not only besting Marco in battle but stealing Marco’s quasi-girlfriend, the Delphine Seyrig-esque torch singer Gina. Gina’s lost too many men to war and aerial combat, and she resents the idea that Marco would rather throw himself back into the fray than settle down with her, but Marco’s got a little too much self-loathing in him to take her up on such an offer. 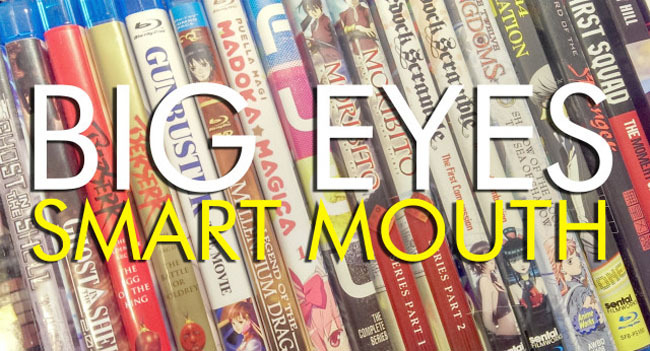 Fio is instantly identifiable as one of Miyazaki’s trademark young-firecracker heroines, but she serves a bigger function in the story than to simply embody one of the director’s signature touches. She is there to rattle Marco’s eyeteeth (tusks, whatever), to wake him up a little, to help him see how his lost faith in other people is not only hurting him, but hurting others who have always been on his side. He’s going to need her help — not just to get his plane fixed, or have her pose as his hostage when he makes his escape from Italy, or win against a follow-up duel with Curtis as a way to keep the Mama Aiutos from massacring him after they track him back to his hideout. Rarely did Miyazaki set his stories in a specific place or time, the only other example coming readily to mind being the lamentable The Wind Rises. 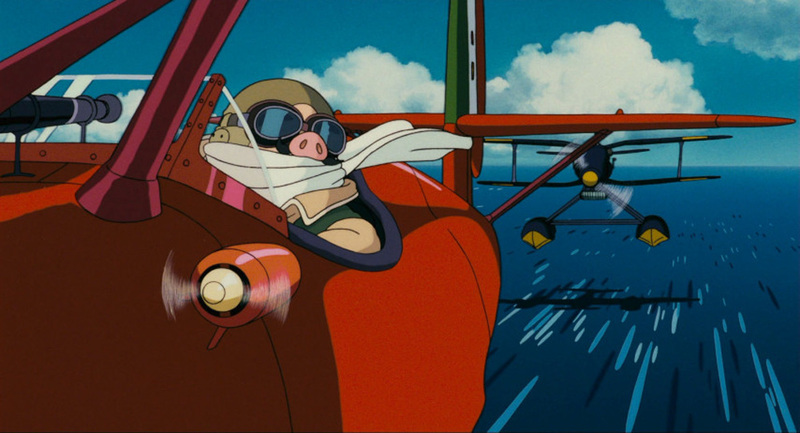 Apart from that movie’s more general failures as storytelling, history, or biography, it felt like an attempt to re-cook some of the same ingredients Miyazaki had served up so much more directly and successfully with Porco Rosso — mostly by way of his love affair with aviation. Rises felt schizoid and jumbled; Rosso tells a more straightforward story, and one where it’s far clearer where the hero is coming from and why. We never learn much of substance about Jiro Horikoshi’s attitude towards his own work, or the world that is only too happy to exploit it unscrupulously. Marco, on the other hand, is much easier to connect with at all times: at the beginning he’s cast in something of the mold of the charismatic-despite-themselves sourpusses of vintage Hollywood (Humphrey Bogart of Casablanca comes most to mind), and later on we nod at his scruffy pride when he admits he’d rather be a pig than a Fascist. That brings us to the most readily debated aspect of the film — what it means for him to have been turned into a pig, the one major nod to fantasy in a film that otherwise stays reasonably grounded in the real world. Ostensibly it’s a metaphor, but for what? My original reading, on having seen the film when it first appeared in an English-language edition some years ago, was that it was a reflection of Marco’s low self-esteem. He’s not proud of having deserted — after all, in war, it’s our comrades who mean as much, perhaps even more, than our professed ideal or motherland — and he would rather hate himself for deserting than hate himself more for staying. We all see him as a pig, but that’s only because that’s what he’s been seeing in the mirror for far longer. And any life where the choices merely amount to different varieties of self-hate is no life at all. He knows this, on some level, but he hides from it — he squeezes into the cockpit of his plane and does jobs for money, because at least those kinds of transactions don’t require emotional commitments. Small wonder it takes an emotional commitment he can’t turn away from — one courtesy of the the naïve, unjudgmental Fio, rather than the sophisticated and worldly Gina — to wake him up. Fio, just by dint of being Fio, by sticking up for Marco (because that’s what you do, you stand by your friends), awakens within Marco the ability to accept that he’s not that bad, and that he is not only worthy of help but love. Marco’s acceptance leads to one of the goofiest, most cockeyed climaxes in Ghibli history, where Curtis and Marco end up pummeling each other senseless in an impromptu boxing match. Miyazaki and his animators tarted the whole thing up in the broadest possible way, a fun strategy for deflating the macho posturing both men have: Marco with his touchy, don’t-try-and-redeem-me pride, and Curtis’s gift-from-God egomania. But even a fathead like Curtis can recognize when the alleged love of his life has eyes for someone else, and even a pighead (I had to say it, sorry) like Marco can see how the best things in his life are right at his doorstep, if only he will open the door for them. In the end, Marco hasn’t lifted his curse, but he has done something at least as good; he’s learned to live with it and make it work for him, not against him. He’s proven himself to be worthy of being called a good guy — not because he finally put one over that American blowhard, but that he has allowed his heart to soften a little and let the world back in. 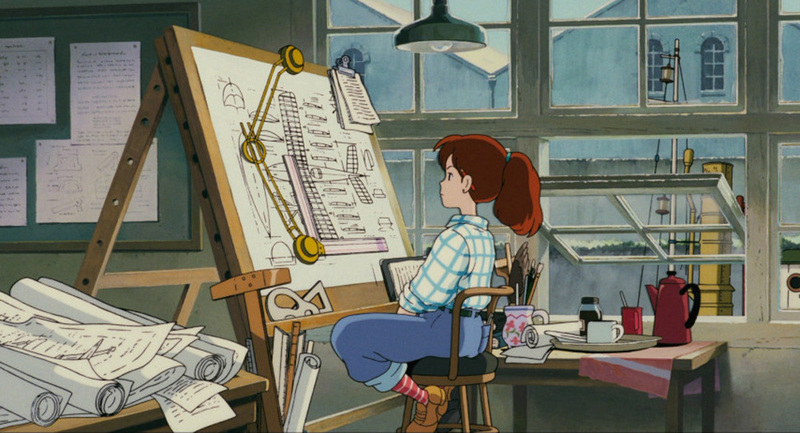 There hasn’t been a Studio Ghibli film yet that didn’t look good, so much so that it almost seems pointless to talk about the craft and professionalism that goes into them. Porco Rosso is as lovely as anything else from the studio, but in a dialed-down way — it’s more akin to the way productions like Only Yesterday or Whisper of the Heart sought beauty in the everyday world, rather than the way Princess Mononoke or Nausicaä of the Valley of the Wind looked for same in flights of fancy. I think both approaches work, in big part because every movie is always built along its own lines, and no movie needs to be compulsively tarted up just to “compete”. The other consistent thread I find in their films is how they are some of the very few movies out there for all ages. 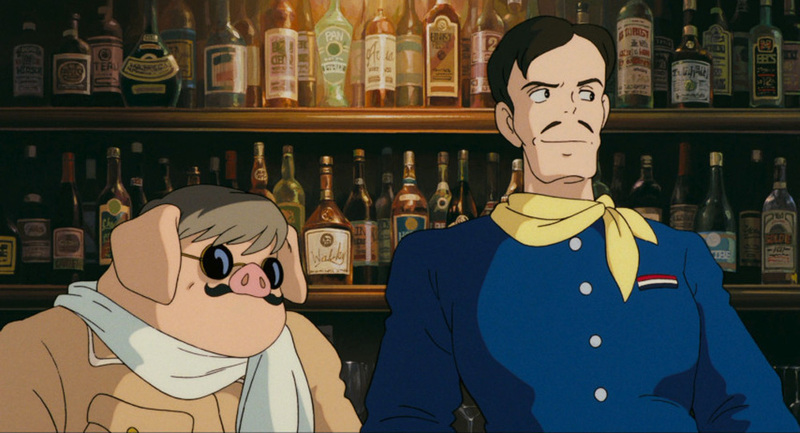 Porco Rosso will appeal more to older children than younger ones (the My Neighbor Totoro audience might well find the history and the adult motives baffling), but there’s never been a film of theirs that didn’t in some way also speak to older audiences. 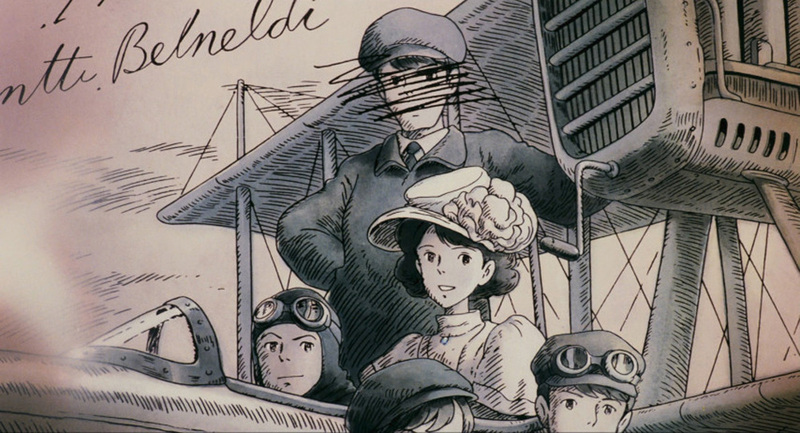 Rosso and, unsurprisingly, The Wind Rises are the two Ghibli productions that address adults most directly, although Rises does so almost entirely at the expense of younger audiences, both because of the subject matter and the muddled delivery. With Rosso, though, one can sense an older man speaking to all who will listen, young and old, albeit in two voices. In one voice, he seems to be shaking his head: Is it worth it, any of it — the way we make it so pointlessly hard to be good, the way we give people so many incentives to screw each other and themselves? But the other voice is the voice of a child: Look! Look! it says. That is, when it’s not laughing. I would love to favor the latter over the former, but when I see how they work together in a film like Porco Rosso, I understand why you need both.